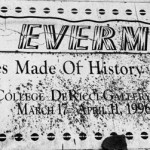 In its heyday, Dr. Evermor’s was more than an art park. It was an experience. 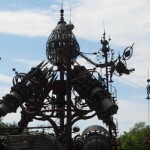 Tom Every would greet visitors to his 300 tons masterpiece sculpture, Forevertron, as his alter-ego Dr. Evermor. Dressed in the customary Victorian-era pith helmet, Evermor would take visitors on a guided tour of his intergalactic travel machine. He would explain – in the first person of course – each of his doodads, their functions and the purpose of the machine. Every went to great lengths to create a sensible world where Forevertron had its place. He built a gazebo with a porch swing for Queen Victoria and Prince Albert to view his impending launch. He also installed an enormous telescope for non-believers to get an up close view of his ascension to the heavens. The twenty-foot tall sculpture, completed in 1983, is billed as the world’s largest scrap metal monument, and seeing it, I have no reason to argue. The decontamination unit for the Apollo 11 spacecraft? Maybe. Tom Every began his career as a demolition and salvage expert. Over the years, he collected thousands of pieces of historic junk that he planned to include in his sculptures. Forevertron reportedly includes two Thomas Edison dynamos from the 1880s, high voltage components from a 1920s power plant, scrap from a near Army ammunition plant, and perhaps most incredibly, the decontamination chamber from the Apollo 11 space craft. Also in the park, which is behind a salvage and surplus store, is an remarkable band of birds. Literally an entire orchestra of birds made of musical instruments. The bass section leader is twenty feet tall and has the body of a base guitar. We were luckily enough to spend some time with his “wife, ex-wife, current wife” (her description). She explained that, sadly, her 73 year-old husband doesn’t get out to the park very often anymore as he is living full-time in a nursing home. But, she’s determined to keep his legacy alive and has personally taken over much of painting, cosmetic upkeep and supervises the building and welding of new pieces. They are trying to find a new place for the park after a falling out with his long-time partner, so make sure you get out here as soon as you can (just off Route 12 south of Baraboo behind Delany’s Surplus). Vic, don’t move… there’s a bug on you. wow, here in Austin there’s a slogan “Keep Austin Weird” but I think Wisconsin has us beat by a mile.